For over 15 years, we have successfully helped businesses on the Sunshine Coast effectively collect bad debts and improve their cash flow. As the leading debt collection agency in Australia, we combine the latest technology and collection methods to make sure your debts are paid fast with minimal cost to you. 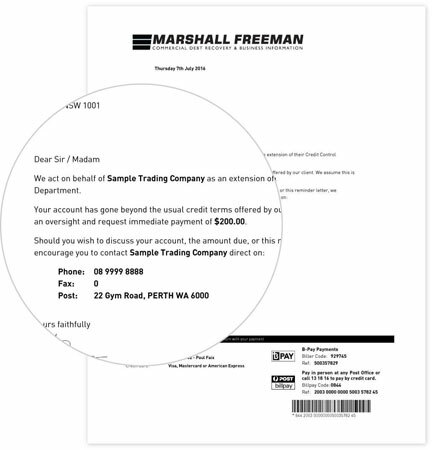 Trusted by over 20,000 businesses, Marshall Freeman provides a stress free and effective recovery process that simply delivers results. Maintaining the highest standards of customer service, our team of specialists understand what it takes to get your debts settled as quickly as possible and avoid unnecessary escalation. We provide personal and commercial collection services to all businesses – large or small, so our experience recognises that each case is unique and can quickly identify a willingness and ability to pay, then apply the right amount of pressure to make your overdue a priority – this is why we are considered the leading debt collection agency on the Sunshine Coast. If you're looking for professional debt collectors that achieve results, please get in touch today as we are able to collect debts most other collection companies write off.